The Battle of Manzikert in 1071 was the end of Basil‘s Armenian Dynasty. The Byzantines had lost Armenia to Alp Arslan and the Seljuk Turks, and Alp Arslan took the Roman Emperor prisoner. So a new dynasty took over the Byzantine Empire, the Comneni. 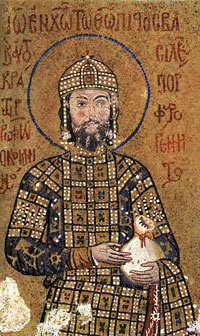 Alexios Comneni succeeded in reconquering part of what is now Turkey in the 1080s, but he still wasn’t very powerful. All that was left now of the old Roman Empire was part of Turkey, Greece, Cyprus, and some of Eastern Europe. The rulers of Western Europe didn’t take long to notice how weak the Byzantine empire had gotten. Soon they took advantage of it. Alexios (probably with the help of the New England Saxons) had to fight off Norman invasions of Greece. 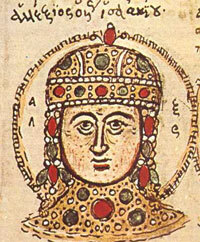 While Alexios was off fighting, his mother, Anna, ruled in Constantinople. In 1074, Alexios and Anna welcomed Saxon refugees to Constantinople and gave them help and advice in conquering part of the Crimea from the Seljuks, which they settled as New England. Twenty-two years later, in 1096, they welcomed the First Crusade and gave them advice about conquering Jerusalem. They seem to have hoped that the Crusaders would rebuild the Byzantine Empire. But instead, the Crusaders started their own independent kingdoms around Jerusalem. Then the Comneni gradually lost control of even more of their land. In Greece, the Normans and the Venetians built castles and took control. The Byzantine army was not strong enough anymore to stop them. Alexios ruled a very long time – 37 years. His power came mainly from his many alliances with the other powerful families of Constantinople. The Comneni finally stopped the civil wars by uniting all the families. 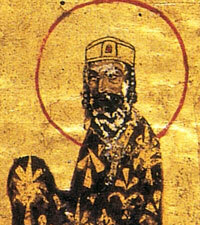 Alexios died in 1118 AD, when he was about 65 years old. But John turned out to be a good ruler. He married a Hungarian princess who stayed out of politics. John took advantage of the weakness of the Fatimids to reconquer a lot of Turkey and Syria. His alliance with the Holy Roman Empire kept the Normans under control. John died in 1143 of an infected wound. His youngest son Manuel took power just in time to greet the Second Crusade, with Eleanor of Aquitaine and Louis VII of France. But by this time the Mamluks had taken power in Syria, and they were a much tougher enemy. Manuel ended up losing most of Turkey to the Seljuks, and all of Syria and Lebanon to the Mamluks. He invaded Norman Italy, but was defeated there. Manuel died in 1180, and his wife Maria took power as regent for their 10 year old son Alexios II. But both Maria and Alexios were dead three years later, as Manuel’s cousin Andronikos seized power. Because Maria was from a Catholic Crusader family, after she died, Andronikos’ supporters massacred many Catholics in Constantinople, including a lot of people from Venice. Reportedly the soldiers killed 80,000 people. Andronikos then lost Jerusalem to Saladin four years later. Andronikos became unpopular and was killed in 1185; in the 1190s, the Comneni lost Cyprus too, when Richard of England took Cyprus away from them as part of the Third Crusade. The Comneni dynasty got weaker and weaker, and lost land in the Balkans to Hungary. The Holy Roman Emperor Henry VI, who ruled most of Central Europe, started to make plans to take over the Byzantine empire and make it part of his empire. When the Fourth Crusade got near Constantinople in 1204 AD, one of the Comneni, Alexios III, had just forced his 20 year old nephew, Alexios IV, out of power. Young Alexios IV promised to pay the Crusaders a lot of money if they fought for him as his mercenary soldiers and got him back into power, just as their ancestors had fought for Alexios I two hundred years earlier. But history repeated itself. The Crusaders won the battle, and put Alexios in power again, but Alexios didn’t have the money to actually pay them. The Crusaders sacked and plundered Constantinople as their pay for the fighting, leaving it poor and depressed, and under the control of Venice. That was the end of the Comneni dynasty. Next the Paleologi took over. Cite this page: Carr, K.E. Comneni Dynasty – Byzantine history. Quatr.us Study Guides, August 1, 2017. Web. April 23, 2019.